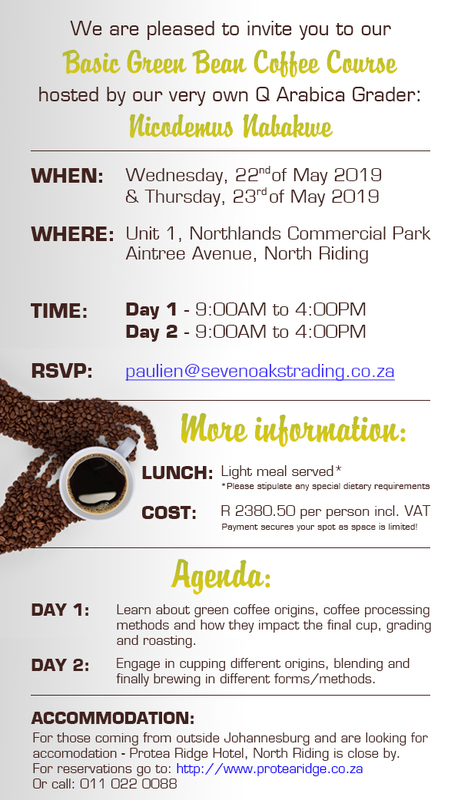 Sevenoaks Trading (Pty) Ltd is a green bean coffee supplier. We import green coffee direct from origin and supply to coffee roasters in South Africa and its neighbouring countries. Sevenoaks Trading had its humble beginnings in 1999, working from a garage in Midrand where the focus was on importing coffees from Zimbabwe for local roasters as well as exporting this coffee to other countries. Since then we have grown and expanded into importing coffees from Central and South America, Indonesia, India as well as the rest of Africa. The bulk of our coffee is stored in a warehouse in North Riding, Johannesburg. In 2014 we partnered with Top Assist to manage a warehouse facility for us in Cape Town. This has been an incredibly valuable relationship and we have expanded our warehousing space in Cape Town twice. Due to the favourable Highveld climate, Johannesburg is seen to have the perfect environment for coffee storage, as there is no need for temperature and humidity controls. Stock in Cape Town has a high turnover and therefore just as favourable. Quality control is done in-house as well as by our trader Paul Cooke in Sevenoaks Kent in the UK. All coffee is bought by approving pre-shipment samples. All coffees are cupped on arrival for quality assurance purposes. We are proud to have our very own qualified Q grader, Nicodemus Nabakwe, spearheading our quality control. We supply to coffee roasters in South Africa over a large spectrum, from selling a minimum of one bag, to brokering the purchase of full containers on their behalf. Coffee in South Africa is an ever growing market. There seems to be a stronger awareness amongst South African coffee consumers for good quality locally roasted (fresher) coffees and they are therefore creating an even higher demand for a locally produced product. The awareness of social responsibility has become an important factor in the lives of roasters as well as consumers of coffee. This includes the farming methods as well as the remuneration of the farmers and their workers. Roasters are moving towards forming relationships with the farmers and not just the traders of coffee. Sevenoaks can facilitate the introduction and maintenance of these relationships. Sevenoaks offers regular training to customers highlighting the process from planted to roasted bean. We incorporate roasting as well as cupping in order to develop and understand the different coffee flavours and to assist roasters in developing and improving their own unique blends. We look forward to being part of your coffee community.